All bridge sessions are now running following a show of hands for the New Year's Eve and New Year's Day sessions to go ahead. Lessons restart on Thursday 3rd January. 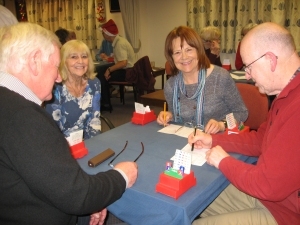 A number of festive events were held at the club, in particular the club Christmas party on Tuesday 18th December where Janet and her helpers, Pat A, Pat M, Pam and Adrienne, provided an excellent meal. David organised a teams event with Ivor & Liz and Ann & John coming first, Garry & Terry, Mike & Robin second and Alan & Rachael and Sandra & Ernie third. Picture shows the club party in full swing with players from all sessions present. Other parties have been the Wednesday afternoon party on the 12th, Thursday morning lessons on the 13th and the Friday evening party (picture shows the winning team) on the 14th. The Wednesday players produced a great spread for the occasion and wished Malcolm bon voyage to his new home in Yorkshire. Robin's lesson group on the 13th were a full 5 tables, played a movement with specially selected hands to reflect the lessons covered over the term, pupils laid on some lovely "eats" and a good time was had by all. On the 14th David organised a fun teams event with 9 teams for experienced masters, regular Friday players and new players moving up from the classes to a club session for the first time. Following the recent club TD training course at the club the results have finally come through, 11th February, (assessment done on January 12th) 2019 and it is good news we now have 5 new directors. Please give them a warm welcome. An Extraordinary General Meeting of the Club was held on Wednesday 28th November, whose sole purpose was to alter the Club's financial year from April-March (as specified in our current Constitution) to January-December. 31 members were present, with several others having their apologies recorded. 29 of those present voted in favour of the change, thus clearly satisfying the condition that a two-thirds majority was required to allow an element of the Constitution to be altered. This technical change will make life easier for the Treasurer and the Committee, but will have no effect whatsoever on the regular activities of the Club. The late Geoff Thomas made the club a generous donation in his will. This has been used to purchase a trophy for the winners of the 65 club competition and Adrienne has had the cup engraved with the names of the past winners. Geoff played primarily at Wolverhampton but also at Stafford on Wednesday afternoons, with Peter Tallon, Audrey Clarke, Sylvia Hilton, Polly Green and Peggie McCombie. Geoff also played in the SSCBA league and came occasionally to the Stafford American Suppers. Pat’s presentation for her 80th birthday celebration. Wednesday afternoon players enjoyed a very merry afternoon helped by Pat’s generous hospitality of cake and sherry. The director wanted to get to grips with scoring a teams event on the tablets - did not go according to plan but was quite enjoyed none the less. More scoring practice needed! Players popped out at odd intervals to see if the eclipse was visible, would you believe that clouds obscured it from start to finish! Two weeks earlier Friday night players said goodbye to Gordon, a very popular member, who has moved away after several years as a regular Friday player. The Dinner and Prize Giving 2018 was held on 6th April 2018 at The Chase Golf Club. A very successful event attended by many club members. Michael hosted the dinner for the first time as Chairman. David and his camera were there of course and you can click here for the pictures. Anne Smith kindly presented the prizes. Presentations were made to President Ivor and to David Alderson, David is moving away and leaving the club after 50 years! The booking for 2019 has already been made for the same venue on 12th May 2019! 26 attended the away weekend at the Samlesbury Hotel in Preston and were joined by a local for the evenings. Aside from the most enjoyable bridge sessions players took advantage of visiting many local attractions, some just walking distance from the hotel. Click here for photos. David has already investigated going back to the same area next year, maybe even to the same hotel. Another very enjoyable blue pointed event at Radbrook Community Centre, SY3 6DZ with a superb afternoon tea. For pictures and results click here. Championship Pairs (Previously known as the Bearn) - Sunday 18th March. This event at Wolverhampton, previously known as the Bearn, was badly affected by the weather, snow and ice mid-March would you believe! The winners are eligible to play in the national competition, The Corwen Trophy on 2nd and 3rd June, and well placed pairs to play in the Edgar Foster cups in September. Two SBC members took part despite the weather. 9 Stafford players, 8 from Robin's lessons, took part in the No Fear Pairs on Thursday 22nd February with Ann and Rose winning EW.